Claude Monet – French painter. The French painter Claude Monet was born on 14 November 1840 on the fifth floor of 45 rue Laffitte, in the 9th arrondissement of Paris. 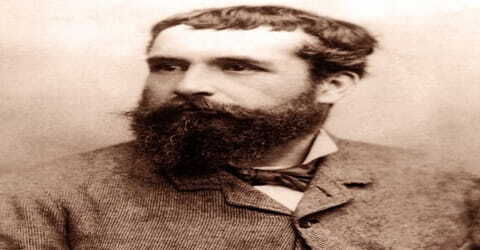 He was the second son of Claude Adolphe Monet and Louise Justine Aubrée Monet, both of them second-generation Parisians. He enrolled in the Academie Suisse. After an art exhibition in 1874, a critic insultingly dubbed Monet’s painting style “Impression,” since it was more concerned with form and light than realism, and the term stuck. Monet struggled with depression, poverty, and illness throughout his life. 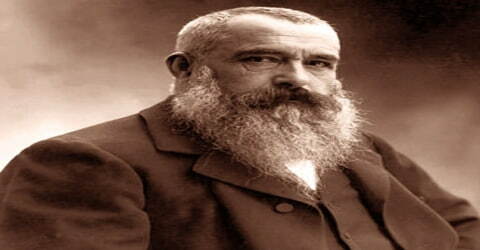 Monet is one of the most celebrated figures in the field of art, and an inspiration to many budding artists. Unlike many other contemporaries of his times, Claude observed his immediate environment and painted it on canvas. His work is also known for the effective use of light. One of Claude’s greatest contributions was his painting style, which was later termed ‘Impressionism’. Artists who had a similar style of painting were since then called ‘Impressionists’. The term was coined because of one of his famous works, the ‘Impression, Sunrise’. Unlike other paintings of its era, this painting seemed like an unfinished sketch, making it seem really different. In his mature works, Monet developed his method of producing repeated studies of the same motif in series, changing canvases with the light or as his interest shifted. These series were frequently exhibited in groups, for example, his images of haystacks (1890/91) and the Rouen cathedral (1894). 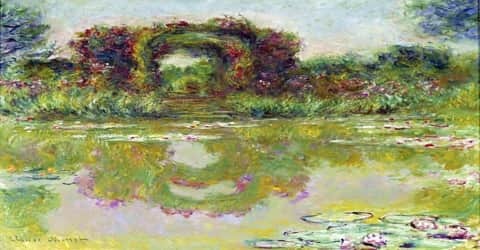 At his home in Giverny, Monet created the water-lily pond that served as inspiration for his last series of paintings. His popularity soared in the second half of the 20th century when his works traveled the world in museum exhibitions that attracted record-breaking crowds and marketed popular commercial items featuring imagery from his art. His ambition of documenting the French countryside led him to adopt a method of painting the same scene many times in order to capture the changing of light and the passing of the seasons. From 1883, Monet lived in Giverny, where he purchased a house and property and began a vast landscaping project which included lily ponds that would become the subjects of his best-known works. In 1899, he began painting the water lilies, first in vertical views with a Japanese bridge as a central feature and later in the series of large-scale paintings that was to occupy him continuously for the next 20 years of his life. Though Monet was considered a great painter by many others, he often doubted his abilities and got depressed. His decision to become an artist made him face several challenges in life. Once he even tried jumping into a river from a bridge owing to an acute financial crisis. Several of Claude’s paintings are displayed at famous museums around the world even till date and continue to inspire many. 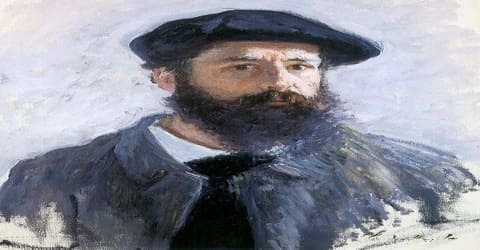 Claude Monet, in full Oscar-Claude Monet (French: klod mɔnɛ), was born on 14 November 1840 to Louise Justine Aubrée Monet and Claude Adolphe Monet. Claude was the second son born to the Monet couple. His father was a businessman and his mother was a singer. In 1841 Claude’s parents got him baptized and named his Oscar Claude Monet. In 1845, his family moved to Le Havre in Normandy. His father wanted him to go into the family’s ship-chandling and grocery business, but Monet wanted to become an artist. His mother was a singer and supported Monet’s desire for a career in art. In 1851, Monet pursued his education in arts from ‘Le Havre secondary school of the arts’. While studying, Claude also made several caricatures using charcoal and sold them in exchange for money. He was well-known for many such charcoal caricature works. He also undertook his first drawing lessons from Jacques-François Ochard, a former student of Jacques-Louis David. On the beaches of Normandy around 1856, he met fellow artist Eugène Boudin, who became his mentor and taught him to use oil paints. Boudin taught Monet “en plein air” (outdoor) techniques for painting. Both received the influence of Johan Barthold Jongkind. On 28 January 1857, his mother died. At the age of sixteen, he left school and went to live with his widowed, childless aunt, Marie-Jeanne Lecadre. By 1859 Monet was determined to pursue an artistic career. He worked at the free Académie Suisse in Paris, and he frequented the Brasserie des Martyrs, a gathering place for Gustave Courbet (1819–1877) and other French painters of the 1850s. Camille, the model of Claude’s famous paintings such as ’The Woman in Green’ and ‘Women in The Garden’, was the first woman in his life. She was pregnant with their first child in 1868. Monet and Camille married on 28 June 1870, just before the outbreak of the Franco-Prussian War, and, after their excursion to London and Zaandam, they moved to Argenteuil, in December 1871. During this time Monet painted various works of modern life. He and Camille lived in poverty for most of this period. Following the successful exhibition of some maritime paintings, and the winning of a silver medal at Le Havre, Monet’s paintings were seized by creditors, from whom they were bought back by a shipping merchant, Gaudibert, who was also a patron of Boudin. Camille was diagnosed with tuberculosis in 1876. The couple’s second son was born two years later, which made matters worse for Camille in terms of her health. Camille’s ill health took the form of uterine cancer. She finally died in the year 1879. She was only 32 at the time of her death. Camille’s death put Claude Monet into depression for several months. After the death of Camille Monet in September 1879, and while Monet continued to live in the house in Vétheuil, Alice Hoschedé, who was his friend’s wife, helped Monet to raise his two sons, Jean and Michel. She took them to Paris to live alongside her own six children, Blanche (who married Jean Monet), Germaine, Suzanne, Marthe, Jean-Pierre, and Jacques. In the spring of 1880, Alice Hoschedé and all the children left Paris and rejoined Monet at Vétheuil. In 1881, all of them moved to Poissy, which Monet hated. In April 1883, looking out the window of the little train between Vernon and Gasny, he discovered Giverny in Normandy. Monet, Alice Hoschedé and the children moved to Vernon, then to the house in Giverny, where he planted a large garden and where he painted for much of the rest of his life. Following the death of her estranged husband, Monet married Alice Hoschedé in 1892. Alice passed away in 1911 due to ill health. In 1859, Monet decided to move to Paris to pursue his art. There, he was strongly influenced by the paintings of the Barbizon school and enrolled as a student at the Academie Suisse. During this time, Monet met fellow artist Camille Pissarro, who would become a close friend for many years. In 1861, Claude joined the first regiment of ‘The African Light Cavalry’. Though he had a seven-year commitment with the cavalry, Claude had to quit after just 2 years, since he had contracted typhoid. It is believed that Claude’s aunt and the famous painter Johan Jongkind had a role to play in bringing him out of the army. In 1862 he entered the studio of Charles Gleyre in Paris and met Pierre-Auguste Renoir (1841–1919), Alfred Sisley (1839–1899), and Jean Frédéric Bazille (1841–1870). During 1863 and 1864 he often worked in the forest at Fontainebleau, France, with other artists including Théodore Rousseau (1812–1867) and Jean François Millet (1814–1875). At the outbreak of the Franco-Prussian War in 1870, Monet traveled to London, England, where he met the art dealer Paul Durand-Ruel. The following year Monet and his wife, Camille, whom he had married in 1870, settled at Argenteuil, France, which became his home for the next six years. 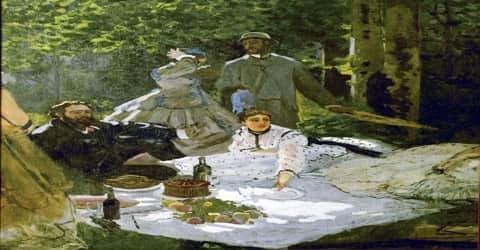 In January 1865 Monet was working on a version of Le déjeuner sur l’herbe, aiming to present it for hanging at the Salon, which had rejected Manet’s Le déjeuner sur l’herbe two years earlier. Monet’s painting was very large and could not be completed in time. (It was later cut up, with parts now in different galleries.) 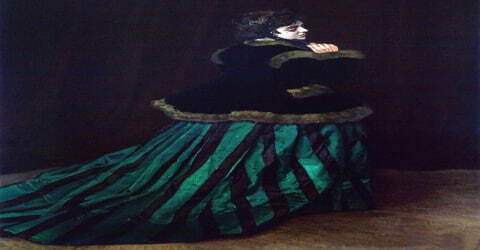 Monet submitted instead a painting of Camille or The Woman in the Green Dress (La femme à la robe verte), one of many works using his future wife, Camille Doncieux, as his model. Both this painting and a small landscape were hung. The following year Monet used Camille for his model in Women in the Garden, and On the Bank of the Seine, Bennecourt in 1868. Camille became pregnant and gave birth to their first child, Jean, in 1867. Monet’s constant movements during this period were directly related to his artistic ambitions. He was interested in natural light, atmosphere, and color, and he tried to record them in his paintings as accurately as possible. A striking example of his early style is the Terrace at the Seaside, Sainte-Adresse (1866), which contains a shining mixture of bright, natural colors. Throughout the 1860s and 1870s, he was often short of money and destroyed his own paintings rather than have them taken away by creditors (those to whom money is owed). By 1868, Claude was in an acute financial crisis which led to depression and suicidal tendencies. Luckily he found a patron in the form of Louis Joachim Guadibert. Guadibert’s interest in Monet’s work made the latter more financially stable. From the late 1860s, Monet and other like-minded artists met with rejection from the conservative Académie des Beaux-Arts, which held its annual exhibition at the Salon de Paris. During the latter part of 1873, Monet, Pierre-Auguste Renoir, Camille Pissarro, and Alfred Sisley organized the Société Anonyme des artistes peintres, sculptures et graveurs (Anonymous Society of Painters, Sculptors, and Engravers) to exhibit their artworks independently. At their first exhibition, held in April 1874, Monet exhibited the work that was to give the group its lasting name. 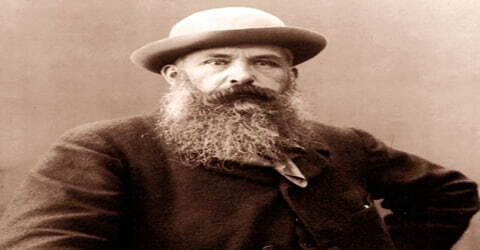 He was inspired by the style and subject matter of previous modern painters Camille Pissarro and Edouard Manet. In 1870, Claude along with his family shifted base to England, following the outbreak of the Franco-Prussian war. During his stay here, Monet observed the works of other artists like Joseph Mallord William Turner and John Constable. Through their paintings, Monet got a whole new perspective about the use of colors. Claude also met Paul Durand- Ruel during his stay in London. Paul was the painter’s first art dealer. By 1871, Monet moved from London to Zaandem, in the Netherlands. Claude made 25 paintings during his stay here, which spanned only a few months. Returning to France after the war, in 1872, Monet eventually settled in Argenteuil, an industrial town west of Paris, and began to develop his own technique. During his time in Argenteuil, Monet visited with many of his artist friends, including Renoir, Pissarro and Edouard Manet—who, according to Monet in a later interview, at first hated him because people confused their names. Banding together with several other artists, Monet helped form the Société Anonyme des Artistes, Peintres, Sculpteurs, Graveurs, as an alternative to the Salon and exhibited their works together. Impression, Sunrise was painted in 1872, depicting a Le Havre port landscape. From the painting’s title the art critic Louis Leroy, in his review, “L’Exposition des Impressionnistes,” which appeared in Le Charivari, coined the term “Impressionism”. It was intended as disparagement but the Impressionists appropriated the term for themselves. 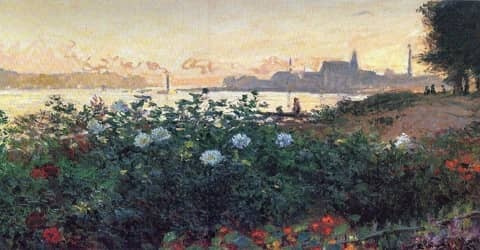 As William Seitz wrote, “The landscapes Monet painted at Argenteuil between 1872 and 1877 are his best-known, most popular works, and it was during these years that impressionism most closely approached a group style.” Monet exhibited regularly in the impressionist group shows, the first of which took place in 1874. 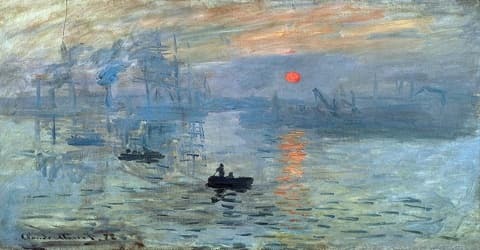 On that occasion his painting Impression: Sunrise (1872) inspired a newspaper critic to call all the artists “impressionists,” and the name stuck. Monet and the impressionists discovered that even the darkest shadows and the gloomiest days contain a wide variety of colors. However, Monet learned that he had to paint quickly and to use short brushstrokes loaded with individual colors. In May 1871, Monet left London to live in Zaandam, in the Netherlands, where he made twenty-five paintings (and the police suspected him of revolutionary activities). He also paid a first visit to nearby Amsterdam. In October or November 1871, he returned to France. From December 1871 to 1878 he lived at Argenteuil, a village on the right bank of the Seine river near Paris, and a popular Sunday-outing destination for Parisians, where he painted some of his best-known works. In 1873, Monet purchased a small boat equipped to be used as a floating studio. From the boat studio Monet painted landscapes and also portraits of Édouard Manet and his wife; Manet in turn depicted Monet painting aboard the boat, accompanied by Camille, in 1874. In 1874, he briefly returned to Holland. 1874 was an eventful year in Monet’s life, when his work the ‘Impression, Sunrise’ was up on display at the Society’s 1874 April exhibition. It was considered to be Claude’s best work. The next two decades, saw Claude earning a lot of money through his paintings. While it was meant to be derogatory, the term seemed fitting. Monet sought to capture the essence of the natural world using strong colors and bold, short brushstrokes; he and his contemporaries were turning away from the blended colors and evenness of classical art. Monet also brought elements of industry into his landscapes, moving the form forward and making it more contemporary. Monet began to exhibit with the Impressionists after their first show in 1874 and continued into the 1880s. Monet painted the subject twice, and it is uncertain which of the two pictures, that now in the Pushkin Museum in Moscow, or that in the Nelson-Atkins Museum of Art in Kansas City, was the painting that appeared in the groundbreaking 1874 exhibition, though more recently the Moscow picture has been favored. Altogether, 165 works were exhibited in the exhibition, including 4 oils, 2 pastels and 3 watercolors by Morisot; 6 oils and 1 pastel by Renoir; 10 works by Degas; 5 by Pissarro; 3 by Cézanne; and 3 by Guillaumin. Several works were on loan, including Cézanne’s Modern Olympia, Morisot’s Hide and Seek (owned by Manet) and 2 landscapes by Sisley that had been purchased by Durand-Ruel. During the 1880s the impressionists began to drift apart, although individual members continued to see one another and occasionally work together. Monet gradually gained critical and financial (relating to money) success during the late 1880s and the 1890s. This was due mainly to the efforts of Durand-Ruel, who sponsored one-man exhibitions of Monet’s work as early as 1883 and who, in 1886, also organized the first large-scale impressionist group show to take place in the United States. By 1881 the original Impressionist group had begun to disintegrate, although it was still to hold two more exhibitions the eighth and last (in which Monet did not show) in 1886, after the advent of Neo-Impressionism. Only Monet continued with the same fervor to carry on the scrutiny of nature. 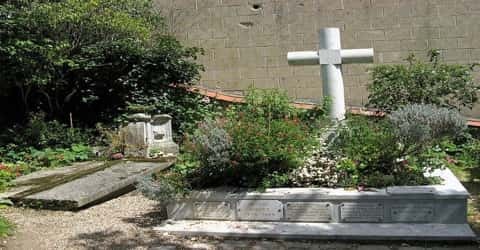 Among the sites, he chose during the 1880s were Pourville, Étretat, Fécamp, and Varangéville in Normandy; the rugged and isolated Breton island of Belle-Île; the wild Creuse River valley; Menton and Antibes in the Midi; and Bordighera in Italy. In 1886 he made a second visit to the Netherlands, to paint the tulip fields, before important sojourns at Étretat and Belle-Île. During the 1890s he devoted his energy to paintings of haystacks (1891) and the facade (front) of Rouen Cathedral (1892–94). In these works Monet painted his subjects from the same physical position, allowing only the light and weather conditions to vary from picture to picture. By 1899 he began work on his famous paintings of the many water lilies in his gardens at Giverny, France. Monet’s late years were very difficult. His health declined rapidly, and by the 1920s he was almost blind. Besides the cathedral, Monet painted several things repeatedly, trying to convey the sensation of a certain time of day on a landscape or a place. He also focused the changes that light made on the forms of haystacks and poplar trees in two different painting series around this time. In 1900, Monet traveled to London, where the Thames River captured his artistic attention. Other series include Poplars, Mornings on the Seine, and the Water Lilies that were painted on his property at Giverny. Between 1883 and 1908, Monet traveled to the Mediterranean, where he painted landmarks, landscapes, and seascapes, including a series of paintings in Venice. In London, he painted four series: the Houses of Parliament, London, Charing Cross Bridge, Waterloo Bridge, and Views of Westminster Bridge. The first (for which he made at least three trips to London between 1899 and 1904) was the extensive multiple series representing the River Thames, the Waterloo and Charing Cross bridges, and the Houses of Parliament. The works exotic coloration and mysterious romantic mood recall the Thames paintings of Turner and James McNeill Whistler. In these paintings it is an atmosphere, more than the particularities of these structures, that is Monet’s subject; buildings and bridges are less tangible than the pulsating brushstrokes that give volume to the light-filled fog and mist. The second and last of the architectural motifs Monet pursued was the canals and palaces of Venice. Monet began this series in 1908 and continued in 1909, although he worked on these subjects at Giverny until 1912. In 1911, Monet became depressed after the death of his beloved Alice. In 1912, he developed cataracts in his right eye. In the art world, Monet was out of step with the avant-garde. The Impressionists were in some ways being supplanted by the Cubist movement, led by Pablo Picasso and Georges Braque. But there was still a great deal of interest in Monet’s work. During this period, Monet began a final series of 12 waterlily paintings commissioned by the Orangerie des Tuileries, a museum in Paris. He chose to make them on a very large scale, designed to fill the walls of special space for the canvases in the museum; he wanted the works to serve as a “haven of peaceful meditation,” believing that the images would soothe the “overworked nerves” of visitors. During World War I, in which his younger son Michel served and his friend and admirer Georges Clemenceau led the French nation, Monet painted a series of weeping willow trees as homage to the French fallen soldiers. In 1923, he underwent two operations to remove his cataracts. The paintings were done while cataracts affected his vision have a general reddish tone, which is characteristic of the vision of cataract victims. It may also be that after surgery he was able to see certain ultraviolet wavelengths of light that are normally excluded by the lens of the eye; this may have had an effect on the colors he perceived. After his operations, he even repainted some of these paintings, with bluer water lilies than before. As Monet experienced in other points in his life, Monet struggled with depression in his later years. He wrote to one friend that “Age and chagrin have worn me out. My life has been nothing but a failure, and all that’s left for me to do is to destroy my paintings before I disappear.” Despite his feelings of despair, he continued working on his paintings until his final days. In addition to Monet’s physical ailments, he struggled with the problems of his art. In 1920 he began work on twelve large canvases (each fourteen feet wide) of water lilies, which he planned to give to the state. To complete them, he fought against his own failing eyesight and the fact that he had no experience in creating large-scale mural art. In effect, the task required him to learn a new kind of painting at the age of eighty. The paintings are characterized by a broad, sweeping style and depend almost entirely on color. Claude Monet’s paintings have been on display at several museums around the world. In 2004, one of his paintings ‘Effects of Sun in the Fog’ was reportedly sold for a whopping US$20 Million, in an auction held at London. 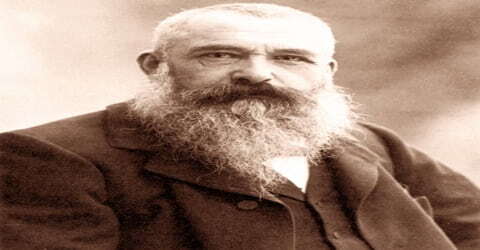 Claude Monet died of lung cancer on 5 December 1926 at the age of 86 and is buried in the Giverny church cemetery. 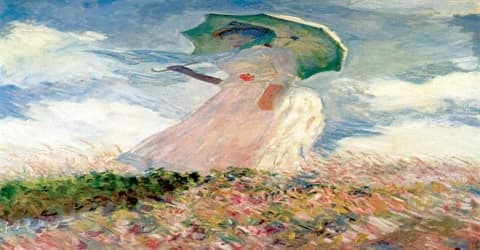 Monet once wrote, “My only merit lies in having painted directly in front of nature, seeking to render my impressions of the most fleeting effects.” Most art historians believe that Monet accomplished much more than this: He helped change the world of painting by shaking off the conventions of the past. By dissolving forms in his works, Monet opened the door for further abstraction in art, and he is credited with influencing such later artists as Jackson Pollack, Mark Rothko, and Willem de Kooning. His home, garden, and waterlily pond were bequeathed by his son Michel, his only heir, to the French Academy of Fine Arts (part of the Institut de France) in 1966. Through the Foundation Claude Monet, the house and gardens were opened for visits in 1980, following restoration. In addition to souvenirs of Monet and other objects of his life, the house contains his collection of Japanese woodcut prints. The house and garden, along with the Museum of Impressionism, are major attractions in Giverny, which hosts tourists from all over the world. Monet’s influence on other artists was wide-ranging, from his near contemporaries such as Vincent van Gogh to a diverse new generation of artists such as Émile Bernard, Pierre Bonnard, Henri Matisse, and Maurice de Vlaminck. During the years 1886 to 1914, a predominantly American colony of artists gathered around him in Giverny and regarded him as an exemplar of modern French painting. They adopted his fresh palette, subject matter, and spontaneous style and eventually introduced these elements to American art.